Introducing APEX…downtown LA’s newest high-rise residential building and the LPC Featured Community of the Month for November! 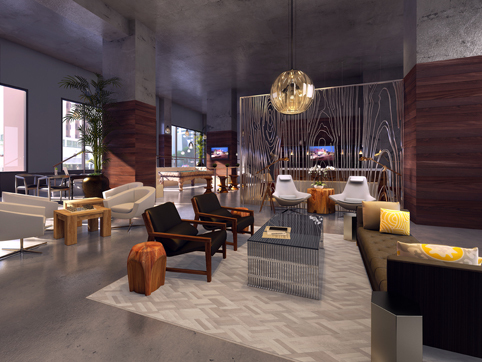 With amenities abound, APEX redefines urban luxury. Located in the midst of all downtown LA has to offer, moments away from Staples Center and Nokia Theatre, APEX soars above the cityscape offering residents glamorous Hollywood Hills and coveted city views by way of vast floor-to-ceiling windows. Studio, one-, and two-bedroom luxury flats and Penthouse suites gleam with designer touches like silica stone counters, European style stainless steel appliances, contemporary fixtures, and gourmet kitchens. Each residence is smart-wired for phone, internet, and cable and in-home washer/dryer appliances are provided. Boasting a seemingly infinite list of community amenities, APEX provides residents places to relax, revive, and reside. The fitness center features towel and water service, cardio deck, and strength resistance equipment and overlooks the sun deck and pool lounge area. This sun and lounge area includes a heated pool, whirlpool spa, fire pit, grilling stations, a multi-speaker audio system and a convenient dog run with paw-friendly grass. Inside, the opulent Live Here Lounge and 3rd floor lounge are designated spaces for residents to work, request concierge services, attend functions and gatherings, and enjoy billiards while watching any one of the HD TVs. 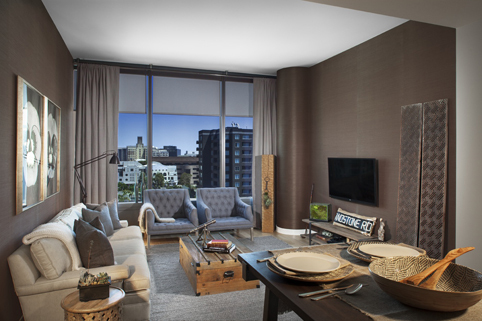 Magnificent views, cosmopolitan design, a perfect downtown location ideal for entertaining; APEX is indeed, The One.